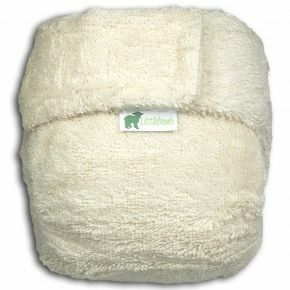 An absorbent sized organic cotton nappy that requires a waterproof cover. An ideal night nappy system or for heavy wetter during the day. This two-part system is also great for newborns as it's great at containing poo explosions! When it comes to a thirsty nappy, this is it. Matched with a LittleLamb wrap it'll absorb most of what your baby can throw at it. A great fitting, best quality shaped nappy that good value too. In addition to certified GOTS certified organic yarn this nappy has top quality elastic and Velcro ensuring they will still perform 100% even after hundreds of washes. Size 1 fits babies from around 7lbs - 18lbs (3kgs - 9kgs) which is generally the age range newborn to nine months. Size 3 fits from 35lbs/16kgs. All nappies come with a fast dry fold-out organic cotton booster sewn in place except for the size 1 which now comes with a separate organic cotton booster. They also come with a fluffy fleece reusable liner.